I don’t believe in maturity models, yet as we roll into 2016, I’ve recognized a widespread need for organizations to identify their digital analytics programs in contrast to their peers. Almost every executive wants to know how their organization stacks up against the competition, and it’s a valid inquiry. Instead of answering this question in terms of maturity, I offer a contrasting perspective of assessing analytics capabilities and competencies. In this post, we’ll address the capability, which is the extent of someone’s or something’s ability. In other words, it’s the power to accomplish tasks, which is far more telling in digital analytics. We are after all seeking the ability to take action on our data…Aren’t we? In my experience with digital analytics, there’s typically a lot to get done. Most organizations aspire to have the capability to collect good data and use it for highly intelligent marketing purposes. Yet, in many cases, the foundational components of digital analytics capabilities have gaps or straight-out holes where critical elements are missing. It is imperative for organizations to think about the capabilities they need to accomplish their digital objectives and begin amassing both the technology and talent to deliver. While there are likely many more capabilities and nuances to best-in-class digital analytics than the ones I will lay out here, I offer the following seven capabilities as the foundational building blocks of any successful digital analytics program. Keep in mind that these are ordered by difficulty and business value, but organizations don’t necessarily acquire these capabilities in order. In some cases, technology can enable a company or team within a company to expedite their capability and skip a step or two along the way. It’s also worth noting that capabilities are related to each other in different ways and that some are symbiotic with preceding capabilities. For example, Data Collection and Data Integration are related (as indicated by the similar shading in Figure 1) because how you integrate data will vary based on your data collection methods. Similarly, A/B Testing, Customer Experience Optimization, and Automated Marketing are all related and will build off of each other as each capability grows. Testing will feed optimization and marketing as these capabilities are put into practice, which will generate more test hypotheses and ideas. While it should be obvious that data collection is the most basic capability, I’m continuously amazed at how much bad data exist out there. This certainly keeps my Partners busy, but there’s nothing like a poor implementation with bad data coming out to undermine the credibility of an analytics program. Starting out with a strategic Solution Design for data collection will mean the difference between just collecting data to have it and actually collecting data with purpose. Clean it up and start off with a well documented solution design and reporting that meets stakeholder needs. Reporting is a by-product of data collection and should provide the visual cues to your organization about how your business is performing. The vital statistics if you will. Reports will often contain lots and lots of metrics, but all too often we see companies that are drowning in automated reports that go unused and unloved all for the sake of checking the we-got-a-report-for-that box. Instead of report-blasting to your colleagues, we advocate performance measurement which purposefully aligns data with desired outcomes. This enables you to report on the three to five big bold numbers that are going to be in your face every week, that the company is going to rally around. It’s amazing the mileage we see when companies take this approach. Try it. Analysis is the capability that takes you beyond the report and deep into the data. But don’t be confused, ad hoc analysis is not “ad hoc data pulls”. That’s not meaningful analysis. Put your brain into it by conducting analysis that follows two simple criteria: 1) Are my analysis tied to clearly articulated hypotheses? and 2) Does this analysis lead to action? While every hypothesis may not lead to action, (you may prove some wrong) by taking the time to think about what you will do (or will recommend) as a result of your analysis is critical for being a productive analyst. Encourage your stakeholders to bring you hypotheses that you can research and prove out using data. Or better yet, lead by example and ferret out what’s most important to them and show how data can prove out a hypotheses you heard them articulate. Many organizations find the greatest incremental gains from their testing programs because inherently, the results prove value. This is what makes testing such a fabulous capability! Companies also often fast-track testing because it is one capability that can be easily acquired with technology. But don’t get hoodwinked by that silver-tongued salesman…testing programs require skilled operators to administrate, execute, and evaluate results. Often times, A/B testing programs that stand-up too quickly don’t have necessary buy-in from stakeholders, which makes pushing winning tests and ideas a challenge. This capability is dependent upon having unwavering faith in your data to go forward with what the data says, instead of relying on intuition, gut, or experience. This capability relies on segmenting customer data to get beyond the basic testing of subject lines, navigational components, and checkout processes. It requires optimizing for different profiles, across numerous customer types, at different points throughout their lifecycles. Experience optimization taps into more than one data stream to reveal the “why” of analytics that can be illuminating for marketing purposes. Best-in-class organizations use Customer Experience Optimization as a method to tap into the propensity for behavior using data cues and analytical processes. 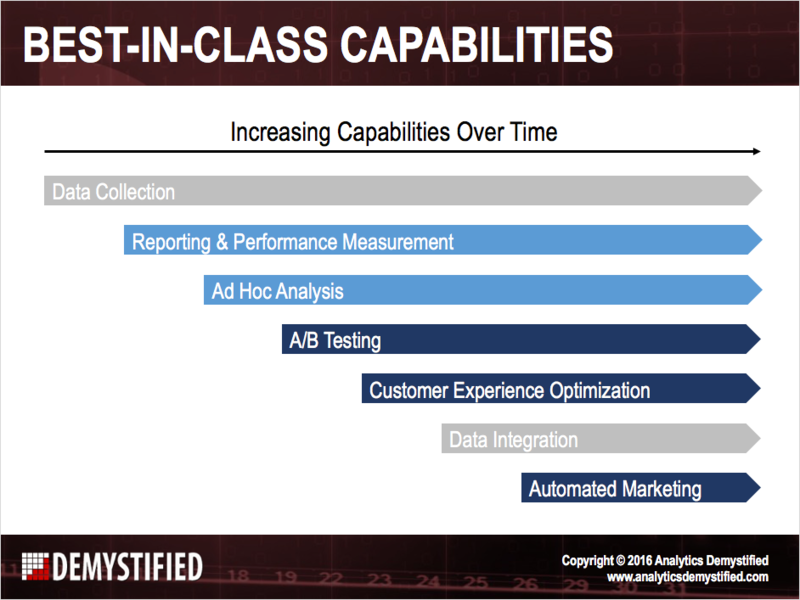 The pinnacle of data utilization is automated marketing. Again, many technologies can assist with automated marketing, but none are worth a tweet unless built from a solid foundation of reliable data – from multiple systems – with thoughtful analysis baked in. Machine learning is a beautiful thing, but you cannot get there unless you know your business and know your customers. The capabilities that precede automated marketing help organizations to arrive at automated marketing by building confidence in data, having a means to conduct strategic analysis, experimenting and optimizing digital assets and using all information available. This is a best-in-class capability that all desire, but very few attain. So there you have it…my seven Digital Analytics Capabilities. I’d love to hear what you think and if your organization has managed to attain best-in-class by acquiring these capabilities, if you did it some other way, or if you’re stuck at any point in the process. Leave a comment and let me know. Like the capabilities model, thanks for the blog. Could you possibly share a bit more about what you mean by Automated Marketing? I’m assuming you mean automating the customer experience optimization so it is “always on”. Would be interesting to hear about some good examples of this best-in-class capability from your experience.